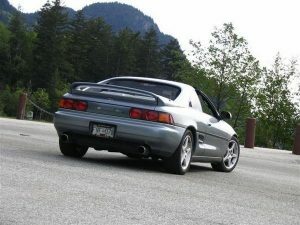 I was recently browsing Revscene and came upon a thread about nice cars in Vancouver. A lot of people were posting pics of Lamborghini’s and Ferrari’s that they’ve spotted on the streets of Vancouver. There sure are a lot of nice cars here but I think my F1 sighting takes the cake. It was about 10 years ago, I was driving across the Iron Workers bridge at night to visit a friend when I heard an engine unlike any I’ve ever heard. Out of the Hastings street onramp comes an orange exotic. As it was right beside me, I couldn’t immediately tell what it was. I was able to tell from the sound of the engine that it was a V12 and Lamborghini had just released their new Murcielago so that’s what I first thought it was. As it pulled ahead of me, I could recognize the doors and was immediately able to tell that it was a Mclaren F1. One of the rarest and most expensive cars in the world. When it was new, it cost about a million dollars and for nearly a 10 year period was the fastest production car in the world. I quickly started fumbling around for my digital camera and kept up for as long as I could to snap this one pic before it disappeared up the cut. I’ve seen a Bugatti Veyron and Lamborghini Reventon up close and personal in a showroom but having a Mclaren F1 rip it beside you is something else.